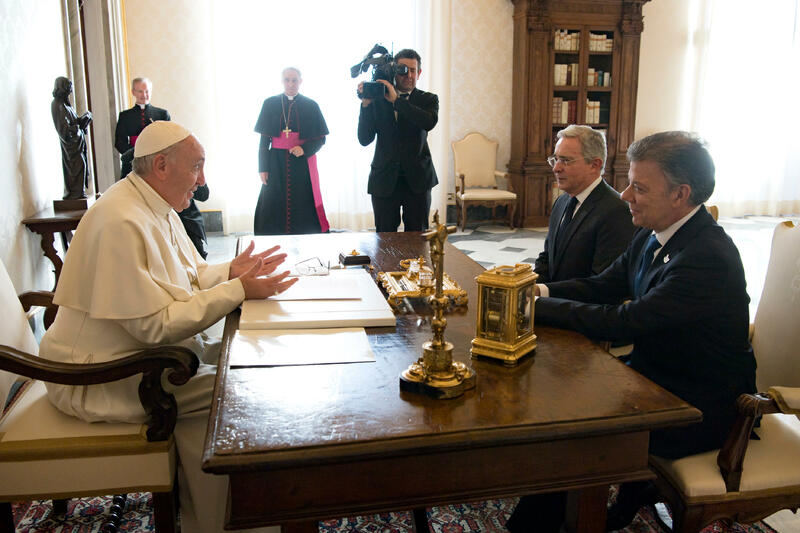 Pope Francis today received in audience the president of the Republic of Colombia, Juan Manuel Santos Calderón, who subsequently met with Cardinal Secretary of State Pietro Parolin, accompanied by Archbishop Paul Richard Gallagher, secretary for Relations with States. The Holy Father went on to meet Senator Álvaro Uribe Vélez, first in private audience and then together with President Santos. The Pope spoke about the “culture of encounter” and emphasised the importance of sincere dialogue between all members of Colombian society at this historical moment. The meeting with Uribe was not on the original schedule and he just arrived in Rome this morning. After four years of talks in Havana, Santos’ government arrived at an agreement to end the 52-year war with the FARC rebel army. However in October, Colombians narrowly rejected the agreement in a referendum. Uribe, who was president before Santos, led the push to reject the referendum, saying that the government should have pulled for stricter measures with FARC. Late last month, Santos and the FARC leader signed a revised deal, which Congress ratified a week later.